This is a sponsored post written by me on behalf of Febreze In-Wash Odor Eliminator. All opinions are 100% mine. When I was growing up I was one of those lucky (aka: spoiled) kids who didn’t do their own laundry. Don’t get me wrong, we had plenty of chores and I folded clothes and put them away, but my Mom handled all of the washing. Suffice it to say, when I moved out on my own I was a complete laundry novice. I had never realized how much labor went into the actual washing of things! Fast forward 12 years and with four kids under six I basically have laundry coming out my ears! Between towels, leotards, jerseys, burp clothes and all the many spills and soils and little outfit changes, I have basically become a laundry pro! 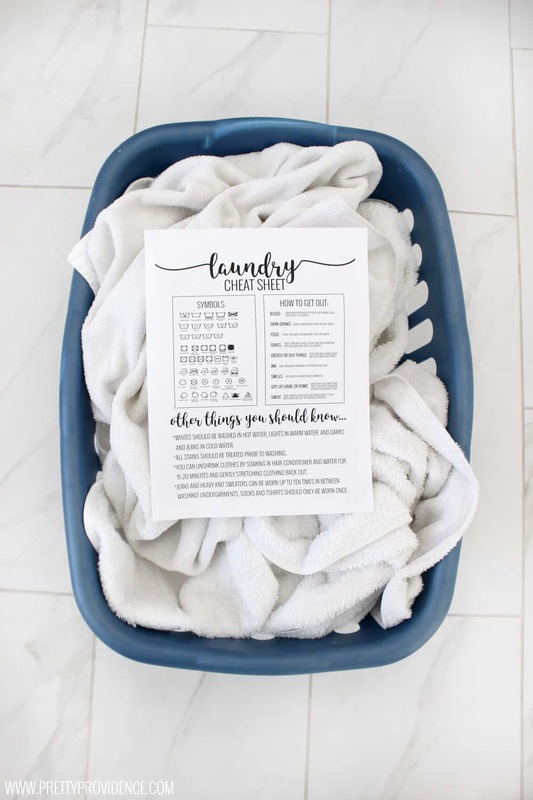 I thought today it would be fun to share some of the laundry tips, tricks and shortcuts I’ve learned over the years all in one easy printable so you can learn from my mistakes and make your laundry life way more enjoyable! One thing that I have consistently struggled with over the years of rearing young children is getting gross odors out of their clothes (think urine, spit up, dirt, vomit… you name it and we deal with it on a daily basis with four kids this little). I would treat them and wash them how I was supposed to, and the stains and dirt would come out but the smell was less than fresh. I tried smaller loads, washing only undies and socks together, even eventually buying a new washer/dryer set, but honestly none of them completely eliminated the odors from the clothing. Enter Febreze In-Wash Odor Eliminator to save the day! You guys, this stuff is amazing. 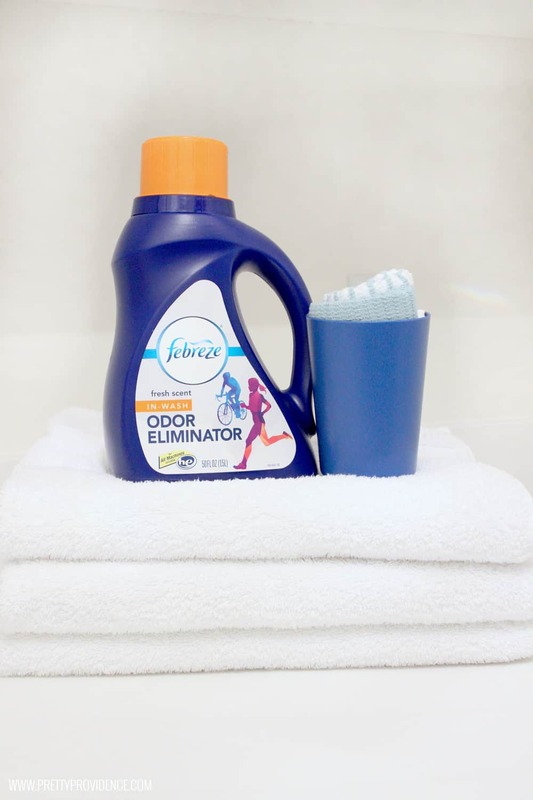 I love the other Febreze products and use them regularly, so when I saw they had come up with a odor eliminator for laundry I knew I had to try it and I am so glad I did! It is so easy to use too! All you do is measure the amount you need based on level of odor, and pour it in with your regular detergent! While your detergent is working to get rid of stains, Febreze In-Wash works to eliminate unpleasant odors in virtually any fabric! Oh, and it is completely compatible with high efficiency washers! If you want to try some for yourself and see how great it is, use these special offers to get a coupon for $4.00 off! Also, you don’t have to take my word for it, check out hundreds of reviews from other thrilled consumers! I’m telling you guys, it works like a dream! 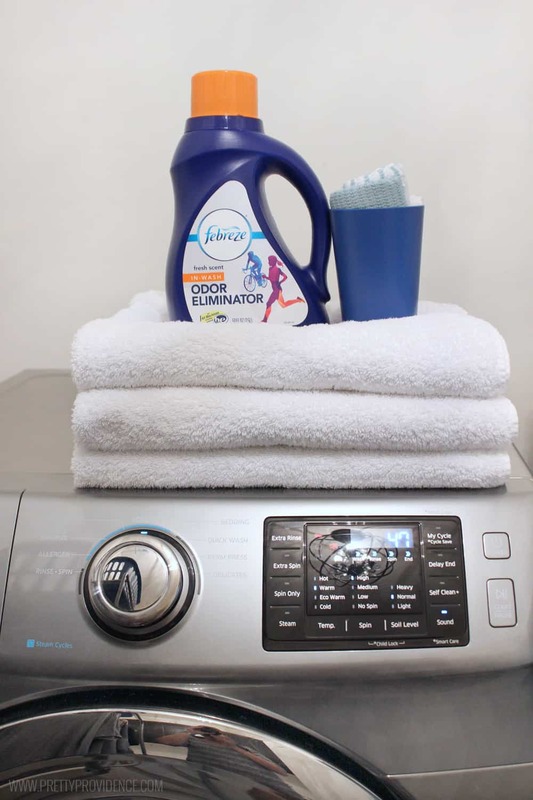 Okay now that we’ve covered smells and I’ve bragged about my new favorite product, are you ready for my master printable with all my laundry knowledge?! Print your own laundry cheat sheet right here! It has everything from explanations for all the laundry symbols, details for how to get out a variety of tough stains, and a few other tips and tricks you may not know! I printed mine out and taped it to the inside of my cupboard in my laundry room, so it’s easily accessible if I need it, but I think it would also look super cute framed on the wall! And don’t forget to pin it for later: Do you have any other awesome laundry tricks that I missed? Drop them in the comments if you do! when i wash anything that has colors that might bleed like a white skirt with red stitching i always add a bit of white vinegar to the wash to stop the color transfer. Oh that is genius!! Thank you so much!! !